APPLE VALLEY, MN (December 17, 2012)−The Ironman World Championship held annually in Kona, Hawaii, is renown for its grueling three-part course: a 2.4 mile swim, a 112-mile bicycle ride, and a 26.2 mile run. Many try out but few qualify for the televised athletic event. Dr. Bennett Isabella, Dakota Dental’s family dentist in Apple Valley, MN, was one of the few. 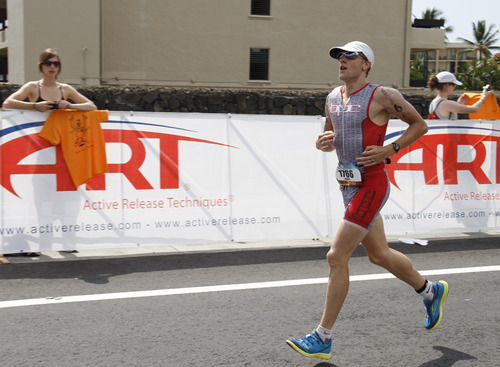 Having successfully finished the Florida Ironman Triathlon among the top three of his age bracket, Dr. Isabella was cleared to enter the Ir­­­­­onman World Championship held October 13, 2012. With a completion time of 9 hours and 32 minutes in Florida, he successfully accomplished his goal to finish the Hawaii event within 10 hours. On the morning of October 13, Dr. Isabella, along with 1,900 other competitors, entered the first leg of the triathlon: the 2.4 mile swim in open water. Next, this Apple Valley dentist began 112 miles of biking a very hot, very windy, and very hilly course. The final leg of the race was a 26.2-mile run in temperatures ranging between 110 and 120 degrees. Finally he reached the last mile with cheering onlookers encouraging him on. He went through the finish line with a time of 9 hours, 56 minutes, and 35 seconds. Dakota Dental serves the southern Minneapolis/Saint Paul suburbs from offices inApple Valley,Minnesota. Dakota Dental provides comprehensive dental services including, but not limited to, preventative dental work, dental implants, dental care for kids, cosmetic dentistry, and dental emergency services. Summary:Apple Valley dentist participates in prestigious Ironman World Championships and finishes within goal time.